Rice (Oryza sativa) is not commonly grown by backyard gardeners, but it is possible. Even if you only produce enough for a few meals, the process itself is quite fascinating. Rice is native to Asia, where it has been grown for millennia. It is a slender grass that grows about two or three feet tall and produces a six to eight-inch seedhead at the top containing the grains. Most people associate rice growing with a system of flooded rice 'padis', but it's not necessary to flood the rice plants, only to keep the soil constantly wet. 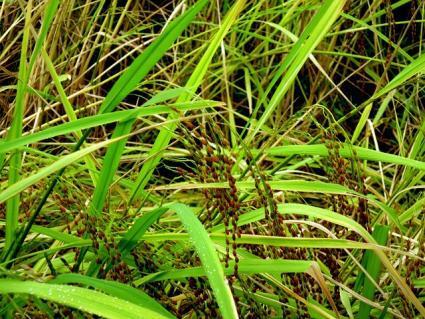 Because rice plants can tolerate standing water, they are one species to consider for water gardens, rain gardens, bog gardens or any areas of the landscape that are naturally wet. There are few food plants that like to grow in poorly drained soil, so rice is an asset for those areas of the landscape. Aesthetically, there is nothing remarkable about the foliage of a single rice plant, but when massed together they have a graceful appearance as they sway in the wind, much like other ornamental grass species. The nodding seedheads are quite attractive. 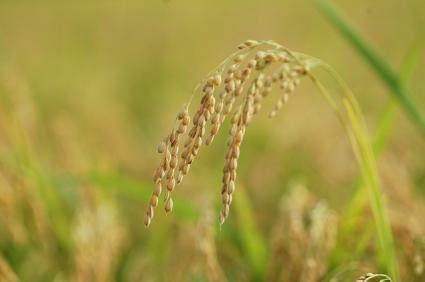 Rice is an annual plant that can be grown in the summer in all zones. However, to produce and ripen its seeds (the edible part), it needs a long, warm growing season such as that found in USDA zones 7 to 11. Rice likes full sun, nutrient rich soil, and cannot be allowed to dry out. The easiest way to obtain rice seed is to go to the grocery store. White rice has been processed and cannot be used, but most other types of rice will sprout and can be planted in the garden. Plant rice in spring once evening temperatures stay above 60 degrees. Prepare the planting area by removing any existing vegetation, loosening the soil to a depth of at least six inches and mixing compost into the soil. Soak seed in a bowl of water for 24 to 36 hours to aid the germination process. Plant the seed 1/4 to 1/2 inch deep, spaced one inch apart, in rows 12 inches apart. Thin the seedlings to a three or four inch spacing once they come up. Irrigate daily or as much as needed to keep the soil constantly moist. Optionally, fertilize with a balanced, all-purpose fertilizer every three or four weeks during the growing season for optimal yields. 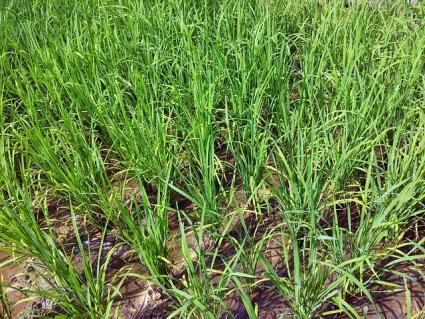 One tip for successful rice growing is to mulch the seedlings once they are six or eight inches tall to conserve moisture and discourage weed growth. 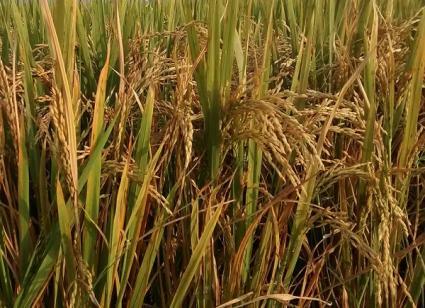 As long as nighttime temperature stay above 60 degrees and the plants are kept well watered and weeded, there is little that can stop rice from growing to maturity. Pests and disease are generally not an issue in backyard rice plantings. 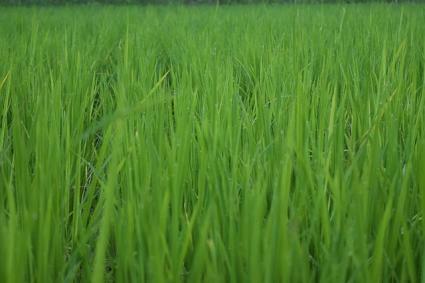 It takes about six months of warm weather for the rice plants to mature. Once the seedheads have formed, cut back on the amount of water. The lush green plants will slowly fade and can be harvested once they are completely brown. To harvest, clip the seedheads off the top of the stalks. At this point, it's wise to spread them out in a dry place to let any remaining moisture content dissipate from the seedheads. Removing the rice grains from the husks is a tedious chore, but it's made much easier by baking the grains at a low temperature (200 degrees) for an hour or so. Then rub the grains between your hands to remove the outer husk. For the winnowing process (removing the husks from a batch of rice once they have been separated from the grains), set up a small fan and pour the rice from one bowl to another in front of it. The heavier grains will drop into the bowl while the lighter husks will be blown away. Now the rice is ready to be stored and/or eaten. As noted, other than processed white rice, any type of rice from the store is fair game for planting. Basmati is a long grain brown rice with very thin kernels and is drier and less sticky after cooking than other varieties. Arborio has a chewy texture and is often called for in risotto. Red rice has a more savory flavor than the other varieties. Sticky rice is sweeter and is used in traditional Asian dessert recipes. Black rice has a rich slightly sweet flavor and bears dark-colored ornamental seedheads. Few gardeners ever consider growing rice, but those that do will find joy in participating in an ancient tradition. Even if you don't have the right climate for the rice plants to grow to fruition - or the patience to harvest the tiny grains - it is still a fascinating plant to experiment with in the garden.